Our school supports and promotes research and innovation culture and activities of our staff and students. We are committed to partnering with other schools and communities to develop teaching pedagogies that help students succeed in our global, evolving, technological world. PROJECT A: Can playing sports improve your grades? Uchenna Academy staff think so. 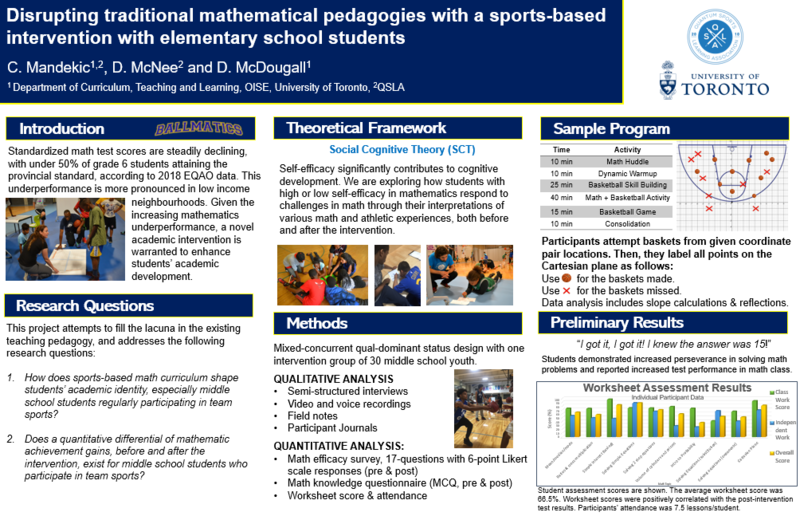 Our staff are conducting a 12-week study to determine the efficacy of introducing sporting activities in mathematics classes for middle and junior high school students. We hope to publish the results of the study in the Fall 2019. The study is part of a post-graduate program at the Ontario Institute for Studies in Education (OISE). Uchenna Academy, under the leadership of our Principal, is actively involved in contributing our knowledge to the teaching community. On Aug 22, 2018 Uchenna Academy facilitated a workshop as part of University of Toronto’s Math Institute Educational Series. We are able to facilitate a PD workshop for teachers at your convenience. Fun classroom activities for middle school math classes | turn a classroom into a sports data collection lab! Contact us at info@uchenna.ca to learn more about the PD workshops with the Uchenna Academy team. Highlights of our presentation at a conference hosted by University of Toronto in summer 2018. High school should be engaging, interesting and have real-world applications. It should reach every student, offer opportunities to challenge their curiosity & awaken their inventive faculties. At Uchenna, we offer one-of-its-kind research based interdisciplinary studies course, sprinkle sports into our mathematics curriculum, complete labs at Ryerson University & offer flexible scheduling. If you need to improve your academics or are wishing to fast track your academic career, then you are at the right address!